March 25th we all came together all over the world and celebrated Earth Hour. Me plushie Instagram Friends also joined in, like last year. Thank you all! You made it an Earth Hour to remember again! Me used me plushie friend photos in this blog. Please know they not mine. If you see a picture that belongs to you and you no want to be posted here, let me know. Me will take it down. 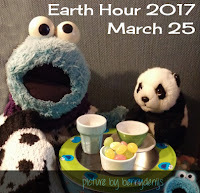 In the meantime: Enjoy our awesome Earth Hour with me plushie friends from all over the world! Yeahhh! Thank you for your great effort and that's a very nice page!Hopefully with it,everyone will appreciate our mama Earth and be wise while using the limited resources. Love and megafurry hugssss from Elmo and Jia (IG: elmoandjia). Thank you so much Jia and Elmo! Also for joining in this year. Great pics. We normally take part but this year we were out at the theatre so missed it.